South Africa natives Lauren Duxbury and Adam Panayiotou will open Panbury’s Double Crust Pies in the Sweet Auburn Curb Market in late February. Offering single-serving and miniature British-style savory pies, such as roasted mediterranean vegetable, sweet and spicy pork, and country chicken, Panbury’s will focus on takeout and casual dining. Below the founders share their plans for the space. Why did you name it Panbury’s? Duxbury: We went through a number of names and couldn’t agree on a really good one, so Adam’s mom suggested that we combine our last names. Plus, it has a British feel about it, and the original concept was associated with British culture. Why are the pies referred to as double crust? Duxbury: Double Crust was included in the name because traditionally a pie that has a crust on the bottom and on the top is referred to as a double crust pie, as opposed to a potpie. We also feel that part of the name is essential in the beginning so that people know what we are selling. We were afraid of being associated with pizzas and sweet pies, so we felt the necessity to be more descriptive. How do you describe the concept to someone unfamiliar with it? Panayiotou: We are taking a traditional British street food and making it more gourmet. The ingredients are higher quality, and we’re using as much local and organic products as we can, but it’s still going to be very accessible. It’s fast-casual, on-the-go, very good quality pies that are basically a full meal in a pie. How did you come up with the idea for Panbury’s? Duxbury: Savory pies are really popular in England, Australia, New Zealand, and South Africa. I’m from South Africa and moved here in 2009. Adam was born there but grew up in the States. Panayiotou: I worked in catering and in restaurants in Charleston, and was serving crepes at the Charleston farmer’s market one day. Lauren bought a crepe and I heard her accent. We started chatting and became friends. Duxbury: I had this concept in my mind and last year everything fell into place. I hadn’t had the culinary skills to start it. My background is in artistry—I worked in galleries. I wanted to start something new. Adam had the culinary experience. Why did you choose to open in the Sweet Auburn Curb Market? Panayiotou: We had been looking for real estate in Atlanta for four or five months. [Edgewood Avenue] has a streetcar that is being built, and one of the stops is outside the front door of the market. Duxbury: We saw how well markets can do in Charleston, and how well up-and coming-restaurants can do in a market situation. Will you have seating in the shop? Panayiotou: The market has public seating. Panbury will be mostly counter service, but we will have a small bar area and a couple of bistro tables. Duxbury: We have about fifteen pies plus seasonal specials. They are savory pies but everyone refers to them as meat pies. 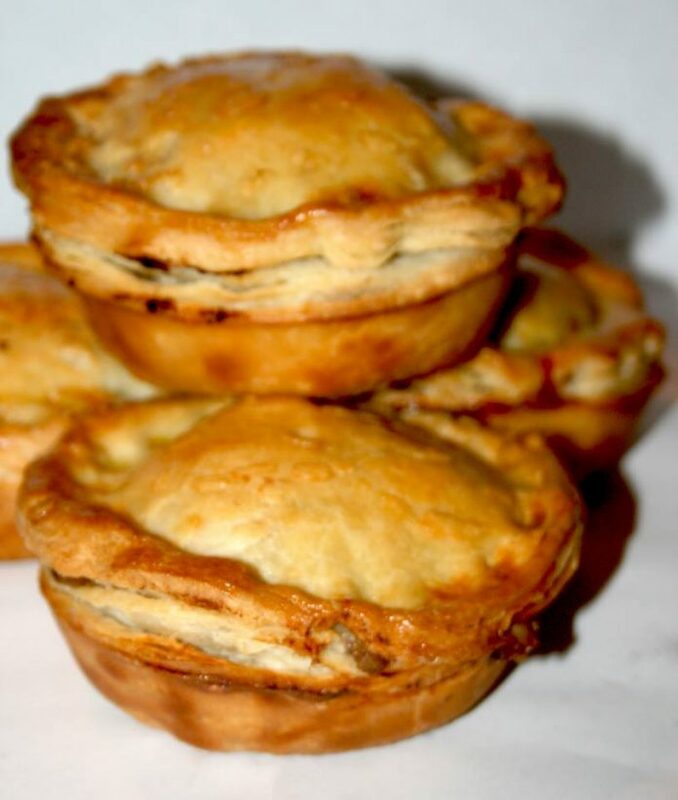 We have chicken, beef, foldovers, vegetable pies, and seasonal sweet pies. We also have sausage rolls, which are basically glorified pigs-in-a-blanket with ground sausage with fresh herbs rolled in puff pastry and cut into bite sizes. We have sides like English French fries, cole slaw, two salads, and mashed potatoes. Panayiotou: The market is working on permits for alcohol because the building is owned by the city. For now, we’ll have Coca-Cola products, specialty sodas sourced from across the country, and hot tea. Duxbury: All pies are single serving. It is a pretty substantial pie: one-third to one-half a pound [rectangular]. We’re also making round mini pies so you don’t have to pick just one. How much do the pies cost? We’re still finalizing pricing, but single-serving pies will likely cost about $5.99.